I can use help with Avid technical information and flying advise. First I would like information an tail structure strengthening and why this was needed in relation to the Avid 4. Also information on safe estimated x-wind limit which I think is about 13 knots for full stick control to keep the wings level. I am about to instruct a pre-solo student and another pilot for tail wheel. Also, what are the qualifications and average experience level of experimental light sport maintenance certficates, and can they sign off required yearly inspections? I have flown a little in the Avid 4 and an older kitfox and several other experimental airplanes, but the Avid/Kitfox have the lowest wing loading I have experienced. Getting ready for the first flight! I've got one, needs covering, were you located? Life is like a roll of toilet paper, the closer you get to the end the faster it goes! Thanks - Akflyerbob for showing friendship ! Logtrucker. Jack Larrabee Clarkston, Wa. DOB 4/12/33 , 509 254 3068,building Avid 4, / Revmaster engine. (Dean Wilson's shop) . 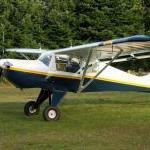 Also purchased a Kitfox / 582 , needs a little policing up before flying. (Logtruckclarkston10@gmail.com). It went to you own special page you get for being a member here!